This empowering self-help book is like a mental multivitamin booster shot, providing you with high-level knowledge and concepts that will make you more consciously and intellectually complete. This book helps to fill the gap that often becomes socially and culturally apparent. Even if you were raised by great parents, if they weren’t doctors, lawyers, and PhDs, then they probably didn’t have the knowledge base and social sophistication to prepare you to compete against the more socially advantaged in today’s age of information, technology, and ideas. Surrogate Re-Parenting offers the rock-solid foundation of intellectual and social nurturing that every person needs to not only measure up, but also surpass the competition. Filled with helpful, witty, entertaining, and mentally fortifying concepts, ideas, and information, this anthology of wisdom for modern-day life deals with the whys, not just the whats, surrounding these concepts and ideas, breaking them down to a level that’s easy for anyone to understand. So, if you’re tired of being dumped, replaced, used, rejected, overlooked, and taken as a joke, while other people enjoy being accepted, selected, connected, and respected, this info is for you. If you’re tired of feeling insecure in the presence of those who have more intellectual wisdom to offer, this book is for you. If you’re tired of being left standing alone, while others are chosen because of the intellectual things that others know that you don’t, this book is for you. If you’re tired of being dumped for someone who is more mature, who obviously has greater knowledge and wisdom, this book is for you. If you’re tired of being seen as dumb, senseless, and stupid by others, when you open your mouth to share what’s on your mind, this book is for you. If you know what you want to say, but don’t have the words to help you say it, this book is for you. The information held between these two covers is the real reason why and how men and women choose who to commit and get married to, because this set of high-level information is what they look for in those that they choose to help them nurture, discipline and raise their children. If you don’t know it, you can’t teach it. If you know it, but can’t put it into useful words, then you can’t share it. If you’re tired of being outclassed and outranked while others move ahead, get picked, promoted, and pass you by, this book is for you. The one who knows the most gets the post. And for those coming from the hood, if you know what I mean, the info in this book is designed to help cause personal transformation. It will get you ready for the life that you want, not just the life that you have. Surrogate Reparenting: A.K.A. 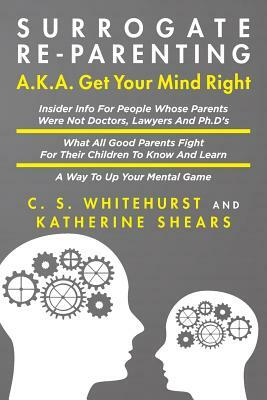 Get Your Mind Right, is already being called the "family reunion" book. This is because people are getting the book, and passing it around, to the members of their family, before the family reunion takes place. People are doing this so that the whole family will all be on a much higher intellectual level, for taking in the knowledge and logic of Doctors, Lawyers, and Ph.Ds. By having this knowledge in common, the dialogue will help them all to get past some family issues and communicate better, which can cause the family to be able to advance and achieve more, on a whole, which is what family reunions are really supposed to be about anyway. So, don’t just allow those who have a leg up because of circumstances of birth sideline you in your personal and professional life. Surrogate Re-Parenting can help you gain the confidence, confirmation, and cerebral strength that will carry you to higher levels of happiness and success. Tell us what do you think about Surrogate Re-Parenting: A.K.A. Get Your Mind Right.